The crew of the space shuttle Challenger honored us by the manner in which they lived their lives. We will never forget them, nor the last time we saw them, this morning, as they prepared for the journey and waved goodbye and "slipped the surly bonds of earth" to "touch the face of God. "—from the Challenger Address. Millions of Americans, including hundreds of thousands of schoolchildren, watched in horror as the Challenger shuttle capsule exploded on live television on January 28, 1986. Coupled with that awful image in Americans' memory is the face of President Ronald Reagan addressing the public hours later with words that spoke to the nation's shock and mourning. 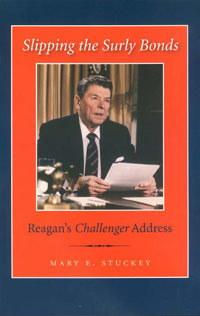 Focusing on the text of Reagan's speech, author Mary Stuckey shows how President Reagan's reputation as "the Great Communicator" adds significance to our understanding of his rhetoric on one of the most momentous occasions of his administration. MARY E. STUCKEY, who holds a joint appointment in the political science and communication departments at Georgia State University, is a prolific author on the subject of the presidency and serves as book review editor of the journal Rhetoric and Public Affairs. She earned her Ph.D. from the University of Notre Dame.